At the end of 2016, the crew of the Octopus Foundation assisted the release of Homerous, a female Caretta caretta marine turtle. 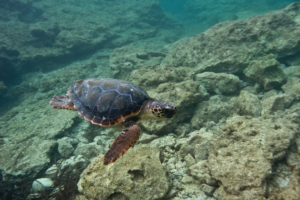 After more than eight years of rehabilitation at the Lampedusa Turtle Rescue Center, and under the careful care of Daniela Freggi and her team, the famous turtle was set free in the sea. In order to follow its return back to its natural environment, the Octopus Foundation glued a GPS Argos beacon to its shell. For this exciting project, the Foundation developed a computer tool that is freely accessible on internet, allowing scientists and the public from around the world to easily follow any animal equipped with these types of beacons. Homerous’ journey was thus scrutinised during six months, until April of 2017, when the beacon’s battery dried out. A few months ago, the Octopus Foundation received an additional donation from the Inner Wheel Club, where we were initially able to raise CHF 6’000.- during an auction in May of 2017. Thanks to this new support, the Octopus Foundation was able to buy an additional GPS Argos beacon. In April, the Foundation’s team will once again head to Lampedusa, this time to glue the new beacon to the shell of a male marine turtle.